Native Colombian Isis Arrieta-Dennis runs a successful business, and she credits OTR’s community-driven Findlay Kitchen with getting her to this point. And her mom, of course. Not only is Isis Julio de Arrieta the other cook in the kitchen, but it's her family recipes that are the foundation for The Arepa Place Latin Grill, where the family serves traditional Columbian arepas and empanadas. Arrieta-Dennis is one of 40 entrepreneurs who are driving food innovation at Findlay Market, where cooks can prep food and create new offerings at the shared-use Findlay Kitchen, in addition to Dirt, a local food and produce market. These new offerings are a boon for local foodies who want to share their passion through food. Space at Findlay Kitchen rents for an affordable $18-20 per hour, making it an approachable option for first-time entrepreneurs. "For most new food producers, the main barrier is access to commercial restaurant space," says Findlay Kitchen director Marianne Hamilton, explaining that many spaces, such as church kitchens, aren't licensed or don't have regular access. But it's about more than cooking space. Since it opened last April, Findlay Kitchen has offered members advice and direction to grow their business the right way. Isis Arrieta-Dennis"They work with us as a coach," Arrieta-Dennis says. "They give us information about licensing. We didn't have any experience. They have been our coach since day one." Findlay Market has a long history of helping businesses grow. It serves as an incubator of sorts, helping launch popular restaurants like O Pie O, Eli's BBQ, Revolution Rotisserie and Taste of Belgium. It’s what underpins the current food revolution in Cincinnati. 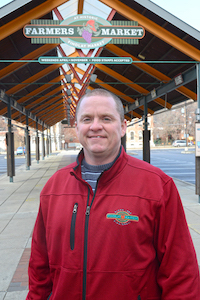 According to president and CEO Joe Hansbauer, the idea for a kitchen incubator was written into Findlay Market’s 1993 master plan. But other projects took precedence: a 2003 remodel of the market and adjoining space, plus the addition of an outdoor farmers’ market — all efforts to bring customers back to the historic spot for local food and other goods. It worked. Prior to renovations, the market house was 50 percent occupied and averaging 250,000 shoppers per year. Fast forward to now: 2016 saw 100 percent occupancy and 1.2 million shoppers, says Hansbauer. Today, it's about helping food producers launch their business and sell their products. Nine months in, Findlay Kitchen is 35 percent utilized. Hansbauer expects that number to increase to more than 50 percent by the one-year mark. It's ahead of where they want to be and Hansbauer is pleased. He expects the kitchen to be generating $175,000-200,000 by 2018, all of which will go back into the nearby market. Meanwhile, Dirt expanded its fresh food offerings to feature 65 vendors, including companies currently using Findlay Kitchen and others who produce everything from fresh eggs, sauces, vinegars and snacks to kitchen towels and aprons. Vendors sell their wares on consignment in the small retail and grocery store. "We want Dirt to be a destination where people can come in and stay for a while and talk," says store manager Tomi Sauerhage, adding that one goal is to become a mini-market, where shoppers can get all of the ingredients for dinner. Lunchtime salads and soups may also be in the shop’s future. In addition to a place to cook, members at Findlay Kitchen can tap into support from Findlay Market partners like Bad Girl Ventures and MORTAR, both of which offer free or reduced-rate legal advice, licensing details and marketing services to help food entrepreneurs grow their businesses. Findlay Kitchen also works with low-income families, refugees and immigrant communities. Says Sauerhage: "We're a melting pot." "Ninety-eight percent of our members don't have a business background," Hamilton says. "What they have is their amazing passion for their food, for grandma's recipe book, for their family traditions." That’s the type of support that helped Arrieta-Dennis secure a license to sell her frozen arepas to Jungle Jim's in Fairfield. At press time, she was targeting delivering to stores for sale the first weekend in February. Bakeologie owner James Avant teaches cooking and baking classes at Findlay Kitchen, where he also bakes and decorates cakes for his other venture, OCD Cakes. Avant started in his home kitchen but had a problem with large orders. "This allowed me to scale up incredibly," he says. "I had to turn down a 3,000-unit order because I couldn't crank out that many cupcakes." Now, instead of just 48, Avant can bake 480 cupcakes at once. Findlay Kitchen allowed him to take his part-time gig to a full-time one. Most home innovators also don't have access to enough storage, so the kitchen offers 2,000 square feet of storage and cage rentals for dry, cool or freezer placement. Food makers can rent space by the hour to prep, cook or bake, says Hamilton. There are 10 smaller kitchens in the space, four known as "pods" designed for members like Eli’s BBQ and Pho Lang Thang that require more than 200 hours per month. Access to prep space beyond their small restaurant’s kitchen allowed Pho Lang Thang to begin opening for dinner, Hamilton says. The rest of the spaces are hourly rentals with options that include cold-prep kitchens, hot kitchens with convection ovens, gas ranges with griddles and a bakery kitchen that includes 60-quart mixers and roll-in baking racks. Findlay Market president and CEO Joe HansbauerCo-packing and distribution are next on Findlay Kitchen’s horizons, Hansbauer says. Moving co-packing out of the kitchen will help small food producers grow their businesses, while distribution will aggregate the deliveries of several small entrepreneurs to retail outlets. Findlay Kitchen is likely to test co-packing this year out of the existing kitchen to determine the need and do it at a rate that makes sense for the producers. If it works, they'll start fundraising and looking for nearby space to add a co-packing kitchen, aggregation point and distribution center. As growth continues, they may eventually also look at offering more rental “pod” kitchens. After relocating to Cincinnati, Arrieta-Dennis did some research and realized there weren't many options for Columbian cuisine here. "When I decided to have my own business, having a restaurant was a natural fit for me," she says. 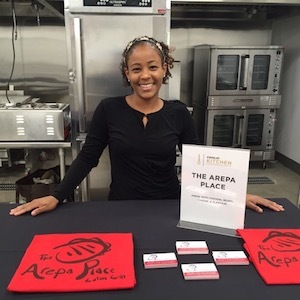 None of The Arepa Place’s food is pre-packaged. They cook and ground corn that is then ground to make the arepas, which are small dough pockets that are then filled with cheese, beans, plantains and meet. "We eat arepas the same way Americans eat bread," Arrieta-Dennis says. Weekend market sales are often a family affair, with Arrieta-Dennis’s husband — a native Cincinnatian — and some cousins helping out at the booth. They have sold as many as 300 arepas in a weekend. They offer corn-based empanadas on some weekends as well. Arrieta-Dennis is excited about what she's learned and for her future. "Everything I know now, and all the doors it has opened for us, are because of the Findlay Kitchen."